Stoneware Vets Bottle Impressed "J. Betts V S Docking"
John Betts listed is listed from 1858 until 1865 as an M.R.C.V.S. 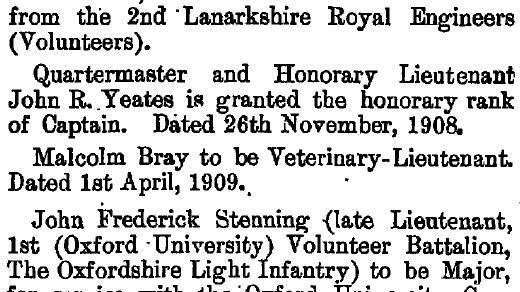 Veterinary Surgeon. 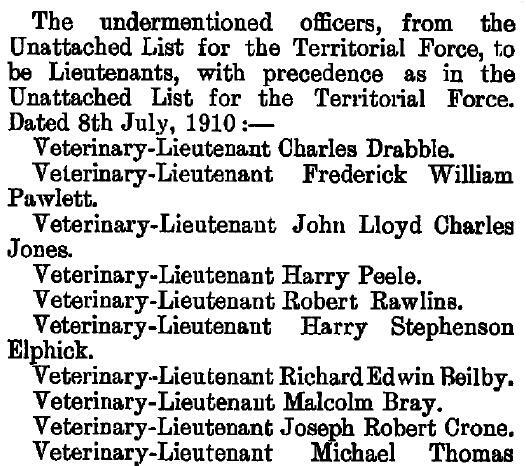 Malcolm Bray Becomes Veterinary Lieutenant in Territorial Army Macolm Bray Resigns from Army 1913. Malcolm Bray started at Docking in 1900 as an apprentice to William Bower he continued to be listed up until 1931 and lived at Manor House Docking. 2 Pint Beer Bottles Embossed "This Bottle Is The Property of George James Docking" 1 Pint Beer Bottles Embossed "James Docking"
George William James is listed at The "Railway Inn" from 1912 until 1929. 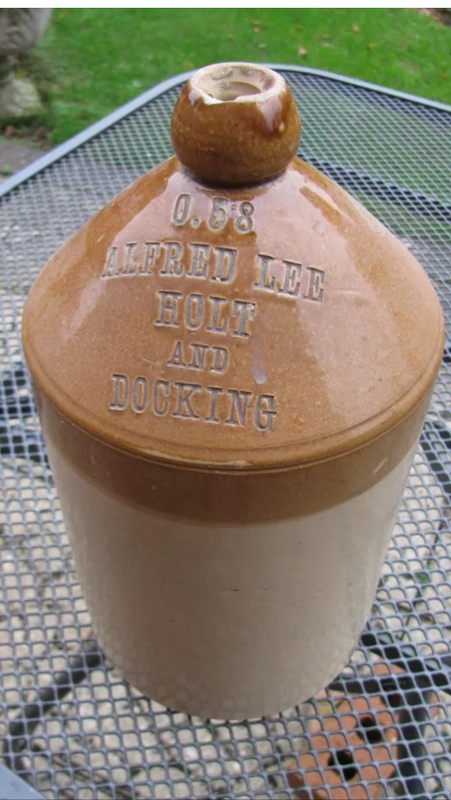 1 Pint Beer Bottles Embossed "Lee Holt & Docking" The Bottle On The Left Has A Backwards N In Docking Glass Whiskey Flask Embossed "Lee Holt & Docking"
1 & Half Pint Beer Bottles Embossed "Lee Holt & Docking" Two Tone Stoneware Flagon Impressed "Alfred Lee Holt And Docking"
Alfred lee was listed as a Wine & Spirit merchant from 1888 to 1933. 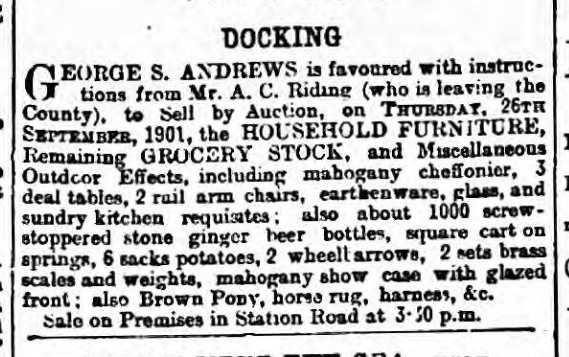 In the 1901 census he was 46 and was listed as a wine, spirit and seed merchant. 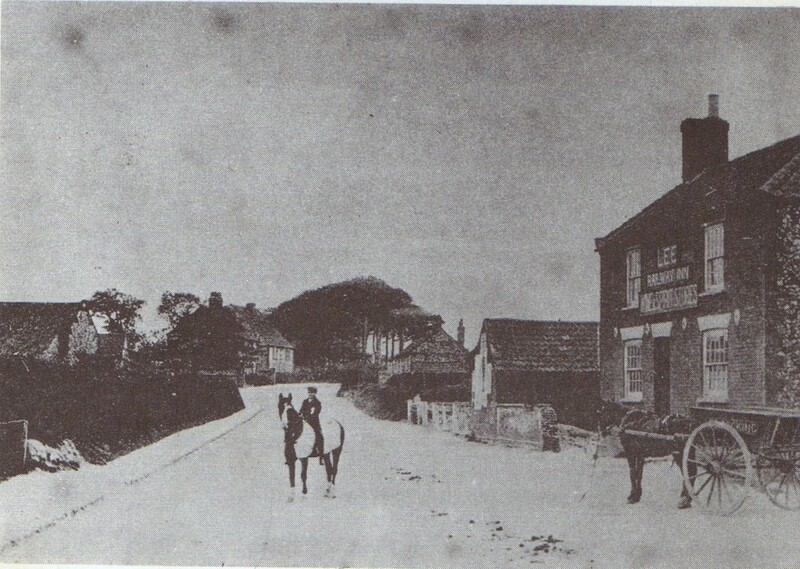 He had premises at High Street and New Street Holt and also his brother William had an outlet at the "Railway Inn" Docking but used Alfred's Bottles. 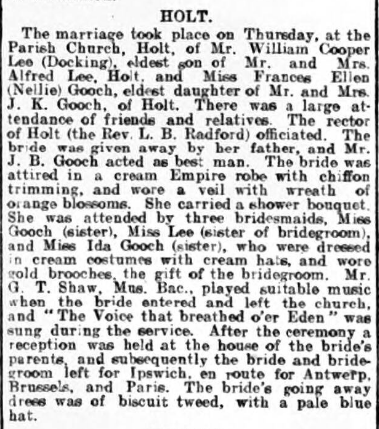 William Cooper Lee was listed from 1904 until 1908. Two Tone Ginger Beer Bottles Printed "This Bottle Belongs To A.C. Riding Home Brewed Ginger Beer Docking" The Left Hand Bottle Made By price Of Bristol The Right Hand By Bourne Denby. 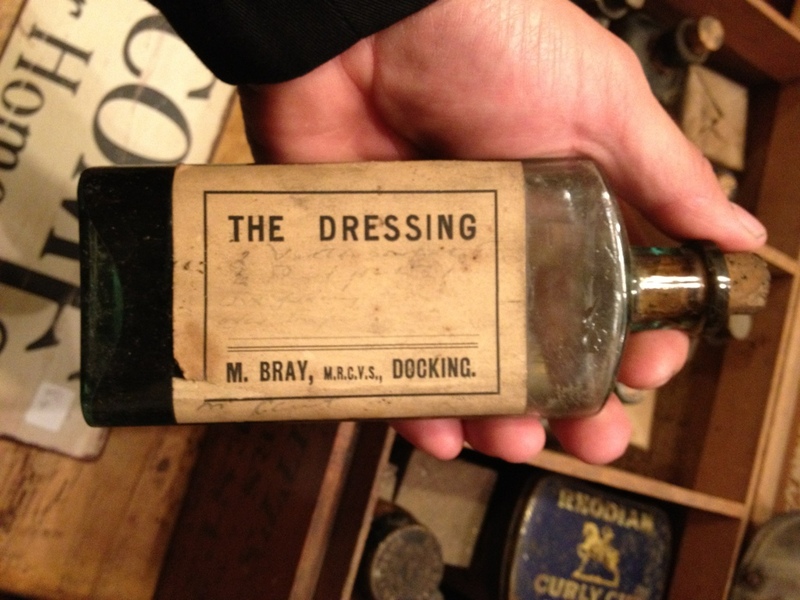 Chemist Bottle Embossed "Ridings Balsamic Cough Mixture High St Docking Norfolk"
Albert C. Riding Listed in the 1892 to 1900 Kelly's Directories and also the 1901 Census as a druggist and chemist.